The Santa Maria Public Airport terminal lobby is almost entirely empty on any given day, and it was on Thursday, Feb. 1. None of the airport's three weekly commercial passenger flights were scheduled for departure or arrival that day, and still, the radio played '80s hits at 9 a.m. The lobby, a single room, was empty except for a janitor, who whistled along to the music as he swept. The digital monitor that lists endless flight departures and arrivals in most commercial airports showed nothing. On a busy day, it will show a single flight at most. The lobby's many chairs sat empty. 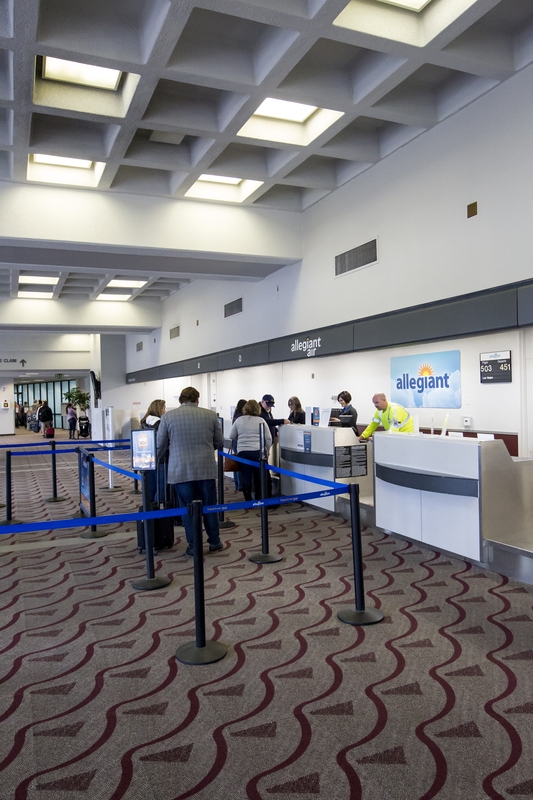 Its ticketing and check-in booths were barren, except for the one currently used by Allegiant Air, the only airline still providing commercial passenger flights at Santa Maria's airport. After various difficulties with scheduling, fares, and baggage, both United and Mokulele airlines parted ways with the airport in the last two years, leaving it with a single airline and the lowest ridership numbers it's seen since 2009. Several airlines have come and gone since the Santa Maria Public Airport District was formed in 1964, and with them, ridership numbers have increased and faltered. 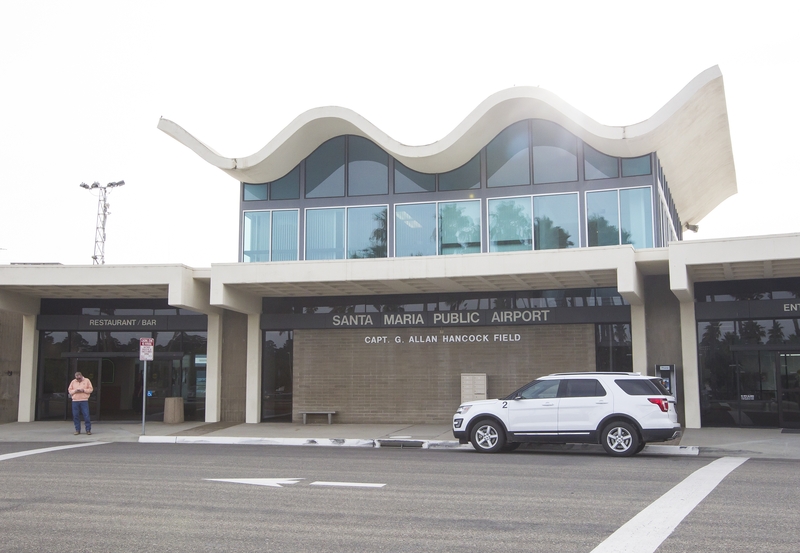 Through it all—including the massive economic downturn of 2007 and a recent shortage of commercial pilots—Santa Maria's airport has continued to turn a profit on the spectrum of services it provides to residents, businesses, and visitors. Still, the current lack of much-needed commercial flight services for Santa Maria's business and leisure travel communities is a major concern for the Santa Maria Public Airport District board of directors, according to Chris Hastert, general manager of the airport. "Attracting new service for Santa Maria is their highest priority," Hastert said. Hastert wasn't surprised when Mokulele terminated its services in Santa Maria. He said the airline faced numerous obstacles providing flights to the area even from the beginning of its partnership with the airport, which started the day after United Airlines left the airport in October 2016. In the beginning, Mokulele flew from Santa Maria to the Los Angeles International Airport, a somewhat popular flight that United once offered at the airport. But Hastert said Mokulele used a nine-seat single engine aircraft, a much smaller plane than the 70-seaters most passengers would generally consider to be "small" today. While many customers simply felt uncomfortable with the plane's size, Hastert said the situation was worse for military personnel, who usually represent a large portion of the airport's passengers, but aren't allowed to use commercial airlines without a U.S. General Services Administration (GSA) contract. Vandenberg Air Force Base's only GSA contract at Santa Maria Public Airport was through United Airlines, according to Vandenberg officials, and Vandenberg has not been authorized to book official travelers through Santa Maria since the termination of United services in October 2016. Vandenberg's personnel now fly through the airports in Santa Barbara and San Luis Obispo, where GSA airlines are still available. Booking flights through a small airport like Santa Maria’s can have real benefits. While most airports charge at least $2 an hour for short- and long-term parking, all parking at the Santa Maria Public Airport is free of charge, according to the airport’s website. Mokulele also lacked many useful interline agreements with other airlines, Hastert said. Interlining is vital to passengers who need to use connection flights through multiple airlines. Such voluntary agreements between airlines allow passengers to change from one airline to another without having to collect baggage and check-in more than once. More importantly, Hastert said if Airline A's flight is late and a passenger misses his connection onto Airline B, Airline B is required to rebook the passenger onto another flight, free of charge. "But if you're on Mokulele and you're connecting onto say United or Delta or whatever it may be, if your Mokulele flight is late, Delta doesn't really care," Hastert said. "They have no agreement with them so there is no requirement that they rebook you or transfer you." Although Hastert said most airlines do rebook passengers with or without interline agreements, travel agents and savvy passengers avoided booking through Mokulele for good measure. And on top of it all, Hastert said Mokulele had a faulty baggage system. Because the airline lacked the proper equipment to print bag tags, Hastert said passengers connecting from Mokulele to other airlines were forced to leave security, gather their luggage, recheck their bags with the connecting airlines, and go back through security. This inconvenient process was necessary even if the connecting airline was one of the few interlining with Mokulele. "So the numbers just really were not good," Hastert said. The total number of passengers flying to and from Santa Maria through Mokulele fell by nearly 80 percent from November 2016 to November 2017, according to data compiled by the airport. In November 2017, the last month Mokulele spent there, only 217 passengers used Mokulele flights. That same month, 3,661 passengers flew to and from Santa Maria through Allegiant Air. Data courtesy of Santa Maria Public Airport. Fortunately for Mokulele, the airport provided the airline with an incentive program, a common practice among airports contracting with new, lesser known airlines. It takes time for airlines to gain popularity in new airport districts, Hastert said, so airports use incentive programs to ensure airlines garner some level of revenue. In this case, Hastert said the airport waived all of its usual fees for Mokulele, including rent, landing, and fuel loadage fees. The airport also offered Mokulele a "revenue guarantee" that required the airport to make up the monetary difference when Mokulele failed to fill a plane to capacity. Mokulele's ridership numbers were so low that Hastert said the airport spent nearly $900 a flight through the revenue guarantee agreement. Despite Mokulele's various attempts at solving its baggage and interlining issues, poor ridership cost the Santa Maria Airport more than $900,000 in total. "We didn't make anything off the flights at all," Hastert said. "And when we looked at the numbers, we were subsidising it so much that it really didn't make any sense to keep it going. Both from our side of it and Mokulele's as well because they couldn't see any future where it would even break even." Mokulele's permanent departure on Nov. 30, 2017, left the airport with a single airline, Allegiant, which offers only three flights a week to a single location. On Wednesdays, Fridays, and Sundays, passengers can catch flights from Santa Maria to Las Vegas on Allegiant MD-80s or airbuses—airplanes that Hastert said can each hold about 166 people. While those flights are quite successful in attracting leisure travelers, the single location leaves businesses and military personnel with few options but to book through one of the larger airports nearby, making it even more difficult for Santa Maria's airport to keep up with its neighbors. The Santa Maria Airport's proximity to the Santa Barbara Municipal, San Luis Obispo County Regional, and Los Angeles International airports has long created obstacles for Santa Maria in both attracting high quantities of passengers and major airlines. Before Mokulele started its contract with Santa Maria Airport in October 2016, United Airlines provided various flights using SkyWest Airlines, a regional airline. Regional airlines are smaller and limited in what they can do independently because they serve under contracts to major airlines. But Hastert said the airports in San Luis Obispo and Santa Barbara offered, and continue to offer, a wider array of much cheaper United flights, sometimes at half the price of flights available at Santa Maria Airport. That ultimately became a major factor in United's departure from the airport, Hastert said. Allegiant Air is the only airline currently providing flights to passengers at the Santa Maria Public Airport, according to General Manager Chris Hastert. While Santa Maria’s airport offers only three commercial flights to a single location each week, the Santa Barbara Municipal Airport offers 22 nonstop flights a day to various locations. With more major airlines—Santa Barbara and San Luis Obispo both use Alaska, United, and American airlines—come better flight options. And with cheaper and more diverse flights no more than 60 miles away, many Santa Marians opt to fly in and out of Santa Barbara or San Luis Obispo. 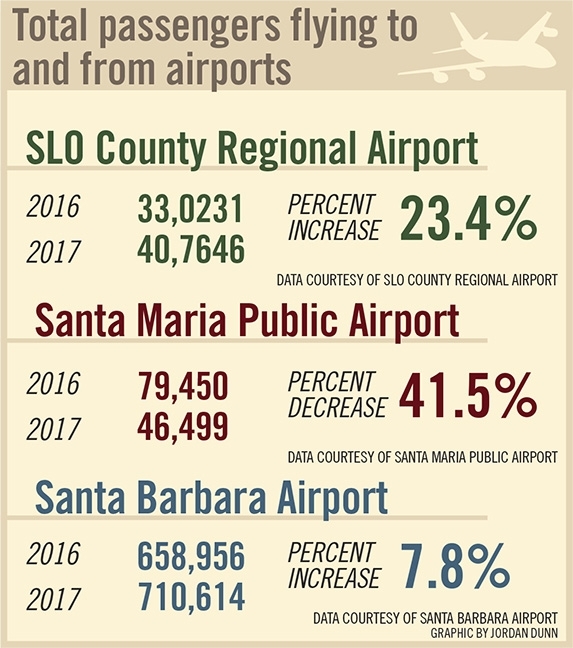 From 2016 to 2017, the total passengers utilizing the Santa Barbara Municipal Airport increased by almost 8 percent from 658,956 riders to 710,614, according to airport officials. While Hastert said Santa Barbara has always served a larger commercial population, the San Luis Obispo County Regional Airport and Santa Maria Airport have traditionally served similar populations. But the San Luis Obispo Airport completed a $35.4 million terminal in 2017, which is at least partially responsible for the airport's 23 percent increase from 330,231 total passengers in 2016 to 407,646 in 2017, according to data compiled by the airport. Those same years, Santa Maria Airport saw a 41 percent decrease in ridership from 79,450 total passengers in 2016 to 46,499 in 2017. The ridership numbers have been steadily declining since 2013, according to data compiled by the airport. Recent times have been hard for many local airports, according to Lynn Houston, marketing coordinator for the Santa Barbara Municipal Airport. The recession of 2007 hit small airports at full force in 2008, and many of them, Houston said, are only just starting to really recover. Almost immediately after the impacts of the economic downturn were truly felt by many airports, 50 individuals were killed in 2009 when an airplane crashed outside Buffalo, New York, causing the Federal Aviation Administration to place stricter training regulations on soon-to-be pilots. Houston said pilots are now required to complete 1,500 hours of flight time before receiving air transport pilot licences. Many local airport officials, including Houston, say the increased regulations led to the current and massive shortage of commercial pilots, which has negatively impacted regional airlines and the airports that depend on them, like Santa Maria Airport, the most. Data courtesy of Santa Barbara Airport. But Santa Maria's airport can take a hit. Its services are extremely diversified, according to General Manager Hastert, and as a result, so are its sources of revenue. In fact, Hastert said a majority of the airport's revenue comes from non-flight-related services. Most of the airport's profits stem from its 2,550 acres of land, which is both used for agriculture and leased out to businesses like the Airport Mobile Home Park and the Radisson Hotel. The airport also leases out 176 small aircraft hangars and groundspace at its 23 private hangars, Hastert said. It oversees shuttle and rental car companies that provide ground transportation services, and it has its own go-kart track. The U.S. Forest Service has an air tanker base on the property, and the airport includes various maintenance facilities as well. "It is very common for smaller airports to have a diversified revenue stream, including non-aviation," Hastert said, adding that many airports don't provide passenger services at all. "An example locally would be the Paso Robles [Municipal] Airport." So why not rid the airport of its struggling commercial terminal? Hastert said that isn't going to happen. Allegiant Air continues to attract high ridership numbers, he said, and the availability of commercial flights provides an invaluable economic benefit to the city of Santa Maria. A successful airport can be extremely important to its city's economy, according to Suzanne Singh, economic development director of the Santa Maria Valley Chamber of Commerce. An airport allows for the efficient trade and sales of goods and services throughout the region, she said, and even having a small airport can help a city recruit new businesses and residents to the area, while providing locals with jobs. Not every city has an airport offering commercial flights, Singh said, and that makes Santa Maria a standout when businesses are considering relocating to or building in the area. Businesses that need employees to travel in or out prefer to do so locally, Singh said, for the simple sake of convenience. "Our local community business owners rely on [the airport] for their personal and corporate aircrafts," Singh said. 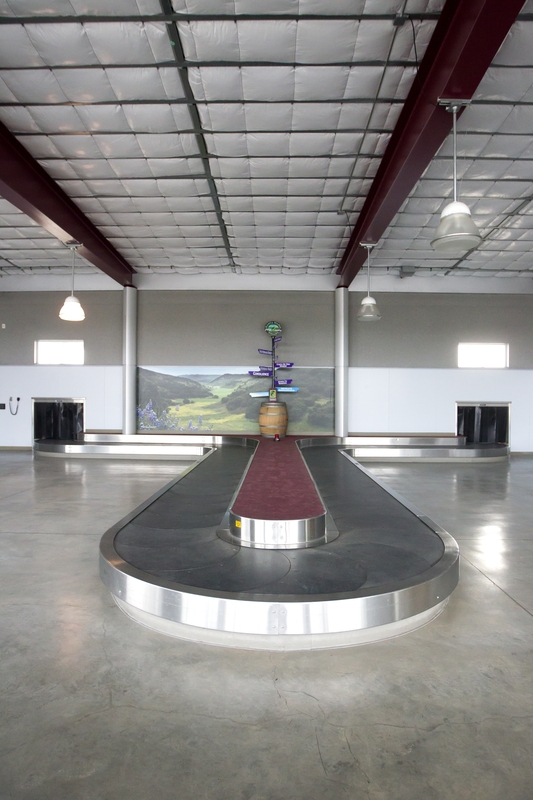 "The airport has been a deciding factor in some of our larger companies coming to Santa Maria and setting up shop." 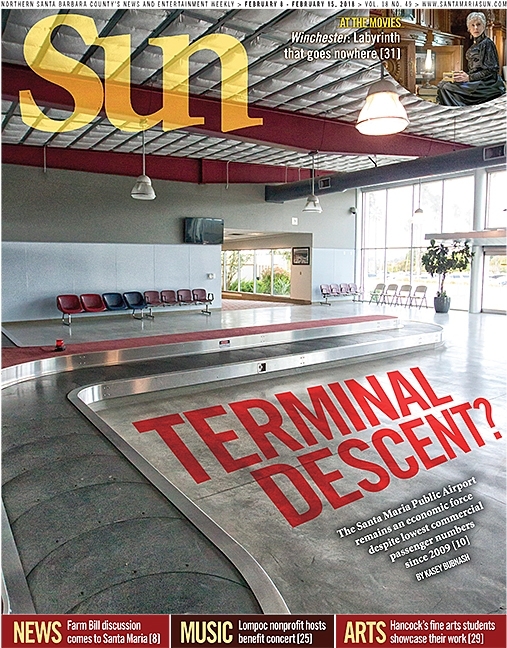 The recent loss of United and Mokulele airlines has left the Santa Maria Public Airport’s terminal feeling rather empty. On the bright side, passengers catching commercial flights to Las Vegas forgo the painfully long security and check-in lines that plague most airports. Many of Santa Maria's largest agricultural and manufacturing businesses wouldn't be here if it weren't for the airport, Singh said. 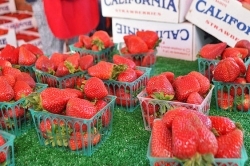 The airport helps Santa Maria's economy in variety of other ways, too. Tourists can easily visit the region, Singh said, and the airport functions as a job center, where various businesses in need of a runway or airport-owned land operate and employ scores of individuals on a daily basis. It also attracts economic activity as a service provider—the U.S. Forest Service, for example, uses the airport as an operations base when fighting fires on the Central Coast. While here, the Forest Service purchases fuel and other supplies, houses crews overnight, and pays fees to the airport. The true breadth of benefits an airport can bring to its city is illustrated in an economic impact study that was presented to Santa Barbara Municipal Airport staff in 2017 by Peter Rupert, a professor of economics and director of the UC Santa Barbara Economic Forecast Project. Rupert, who studied the airport and its effects on Santa Barbara's economy throughout 2016, found that the airport employs roughly 2,000 individuals and has a total economic impact of about $200 million. Although the exact economic impact Santa Maria's airport has on the community is unclear, Singh said its diversified sources of revenue give it an opportunity to participate in many aspects of economic development. It also gives the airport some indepence from the unreliable commercial passenger flight industry. As Santa Maria grows, Singh said she and other chamber members hope the airport will grow with it. "First and foremost, we'd love to see regularly scheduled passenger service to one or more major hub airports so that we're connected to the system," Singh said. "Beyond that, we think there is great opportunity for Santa Maria Airport to evolve into a major jobs center as businesses locate their operations there." Re-establishing hub service to benefit the business and military community is the airport board's highest priority, General Manager Hastert said. The board, he said, hopes to partner with a major airline that could provide eastbound flights to hub airports in Denver, Phoenix, or Salt Lake City. The annual JumpStart conference, which will be hosted by Airlines Council International in June, will be an opportunity for airport representatives to meet with several major airlines, Hastert said. "Our No. 1 priority is air service for our community," Hastert said. "Most businesses rely on air service, and if they have to drive an hour or more to get to an airport to fly out they're more likely to relocate somewhere closer to a different airport. So we are really trying hard to re-establish hub service." Contact Staff Writer Kasey Bubnash at kbubnash@santamariasun.com.